Nice and good hotel. Good part for us was that we were told that this hotel had halal food which solved our food problem. Only inconvenience was the breakfast time where one has to queue for breakfast. We felt loved and cared for. We felt welcome. The reception staff were helpful, enthusiastic and very respectful. We loved the room the bed and the fluffy towels. A spirit of generosity pervades the Hotel s atmosphere. Oh. My first kettle since we arrived in Spain 3 weeks ago. For four stars the hotel was quite basic. The room was clean but not luxurious at all. Also it was bitty that the hotel had no gym or any other activities like f.ex the Mercure Lisboa on the city centre has. Staff was very helpfull and friendly. Special thanks to that. The location of the hotel was unfortunate surprice since the moving for hotel to the city centre was more difficult than expected. Also I was unhappy with the booking since I had to book the hotel throught eBookers because I could not find the direct details to the hotel and when I found the email address I got no responce for weeks. A clean and comfortable stop with helpful staff and easy parking. This Hotel is the complete package! This hotel was the complete package for us. From the breakfast buffet, to the underground parking, to the location it had it all. But most importantly was the friendly and helpful multi-lingual hotel staff, They were awesome. Highly recommended! We will definitely be back! All amenities were in place to make my seven day stay very comfortable. Your front desk personnel were exceptional. 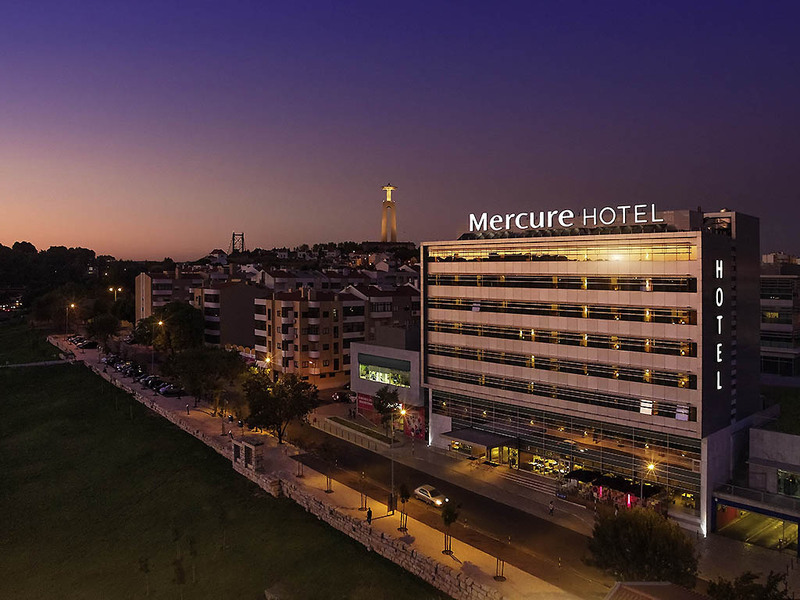 Our stay at the Mercure Hotel Almada was quite good with one small hiccup. On our second night my husband went down to request some green tea, coffee and sugar as we had left our DO Not Disturb sign on our door throughout the whole day by mistake. At the time my husband went downstairs there was a huge group of people who had just arrived in a bus and the person at the desk said she couldn’t move from the desk but will organise someone to help out. A couple of minutes later we had a knock on the door with a handful of coffee and all types of tea except green tea and no sugar. My husband went back again downstairs to ask for sugar and green tea. He came back with sugar but no green tea. I guess the Hotel would be award of this group of people coming and should be prepared with additional staff so other customers could be serviced appropriately too. All of our expectations were met. The staff was professional, courteous and extremely helpful. The amenities were great. The location was perfect for us. 1 night business stay. Comfortable, modern hotel Friendly staff. Good size comfortable rooms and en-suite. Good breakfast. No alcohol served! Anywhere. Neither bar nor restaurant so could not enjoy a nice Portuguese glass of wine with my dinner. Walls hear everything because they're thin. Staff is stellar, both night and morning. I did not get any sleep because of the walls are thin. I heard children getting up and a person throwing up or coughing hard. My wife and I wanted a week away from dreary English January's without getting so hot that returning would be a fatal shock. Where better than Lisbon? Just right. I knew becuase I had been there on business in January before. I booked through a holiday group and they made the choice and what a good choice it was. Being in Almeda was calmer than the centre or northern part of Lisbon. So we enjoyed the location, just close to the Christos Rei and easy to get into the centre of Lisbon via the tram to Cacilias and bost to the ferry terminal. Now for the hotel itself. Top marks to the restauarant staff and management. Their service required no extra bidding asking or anything. Spot on all the time even if they were coping with a hundred Chinese tour customers at the same time. We cannot speak Portugese but your staff never let us down always working to improve their English to help us. The food is interesting and varied, always good to try another country's style. The helpings are very generous, in fact after a couple of days we were in fear of our waistlines exceeding their limits and your staff without question provided one serving and two plates. Your lamb chops and steak tartare were particulary good. As for our accommodation, a lovely airy room, well appointed by the standards we expected and always supplied clean. A good view as well, it's a townscape but a really interesting vista of the park, the town and who ever says that trams, trains and ralways ahave no romance have missed the point. The public rooms are fine, a good place to relax while planning the next trip. In all a well rated visit. Very polite and helpful workers, from reception to the room service/cleaning. Great hotel, friendly staff and clean rooms! All the staff that we encountered at the hotel were very friendly. The front desk gave us great recommendations on things to do and helped us figure out the transportation. The rooms were spotless and were cleaned daily. The hotel itself has free parking in the parking garage and is located in a safe area in town. I'd recommended this hotel to family and friends. A bar with no beer. A very nice hotel. Confortable rooms with giant beds and giant baths. Good temperature control. Good television with a nice range of channels. The staff were efficient and very friendly which makes all the difference. A very nice and varied breakfast. This hotel in Amada is a good place to stay. From the nearest tram stop of Ramalha you can get to Cacilhas, and the ferry to Lisbon very easily. If you're sick of culture and fancy McDonalds and a movie you can pop over to the Amada Forum shopping centre which has tonnes of great eating places anc English movies. Don't forget the Sunday Gypsy Market. Very nice very cheap clothes. Thanks Mercure and see you again! Since I've reserved directly on the hotel website, I didn't expected that Mercure Lisboa Almada will give me a room with view to the backyard on 2nd floor hotel which is located at ground level. I supposed that this kind of rooms were reserved for clients that books through Booking.com or similar. I was wrong. I've asked to change to another room but the staff at the reception desk told me that the hotel was full. Another unacceptable situation for a 4 stars hotel was that there was no toilet paper on the room. We've asked for it at reception desk. The breakfast was good and the staff was kind.